Stoneware, threaded relief, 2.0L or 1.5L, pewter lid. Design attributed to Leonhard Hellmuth. 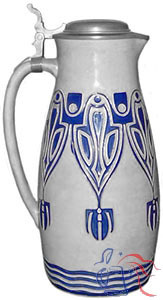 This is one of forty designs, sixteen of which were steins, created by Hellmuth for Merkelbach in 1904. These pieces are designated “H1” through “H40” in the 1905 manufacturer’s catalog, though only a stand-alone numerical designation (i.e., “20”) is found on the base, along with Hellmuth’s “LH” signature/logo.